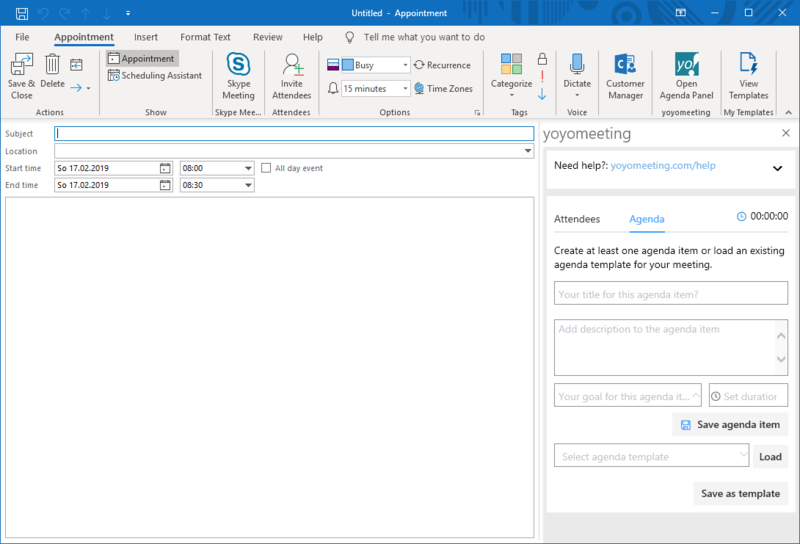 Everything you need know to add agenda items with title, description, goal and time box in the yoyomeeting Office 365 Outlook add-in. The cool thing about yoyomeeting is that it does not force you to use a completely new tool for your meetings, but that it just alters Microsoft Outlook and therefore supports the way you already work, using the tools you already use. You can schedule your meetings with Outlook as you always did – no change on that. But when it comes to adding an agenda, just click on the yoyomeeting icon in the Outlook ribbon (that’s the bar with all the icons on top of your Outlook). And now the yoyomeeting add-in kicks in and provides the following options to easily create an agenda for your meeting. The name says it all, I guess. Just ad the title what the agenda item is about. Here you can add some (or more) explanatory text what the agenda item is about and what you want to discuss/present/… in this part of your meeting. INFORMATION: Some parts of your meeting are just for transmitting information, probably rather uni-directional. Use this goal to exactly do that. WORKSHOP: Encourage your attendees to get invovled by using this goal for your agenda item. And since your participants know the agenda before the meeting starts (thanks to yoyomeeting), people can prepare properly! To get things done, set ambitious time boxes for your agenda items. These are scheduled in 5 minutes slots. Please feel free to take as little (!) time as needed – and dismiss planning just in 30 minutes slots, the standard suggestion for meetings by your Outlook calendar. You add the agenda item to your agenda by clicking “Save agenda item”. This copies all information to the text section of your Outlook meeting. This helps attendes to read your agenda on any mobile device with small screens. Furthermore, this locks-in the agenda item for the later meeting management process.